I remember seeing my first gun battle. It was September 1979 and I was strolling through the streets of Beirut looking for somewhere to eat. Two cars collided. The occupants jumped out and started to argue. One produced a handgun, fired without warning and ducked down behind the bonnet of his car. The other opened his boot, pulled out a Kalashnikov and sprayed the other car’s windscreen with bullets. More cars arrived, gunmen emerged and a full-scale battle ensued. I remember everyone scattering and diving for cover but I just stood there transfixed. It was after all my first experience of war. Bullets ricocheted everywhere and the sound of police sirens echoed through the narrow streets. That’s when I saw the man beckoning me towards his doorway. He was smiling. I walked towards him almost in a trance. He grasped my hand, squeezed it tightly and pulled me inside, slamming the door shut. He was bald apart from a few strands of hair lacquered onto his head and was immaculately dressed in a dark tuxedo with a bow tie pulled tight around his neck. I couldn’t help noticing that his collar was frayed and dirty. I chose a table behind a pillar and ordered a large scotch. The restaurant was packed with families, chatting and laughing loudly, trying to ignore the carnage taking place outside. The waiter returned, handed me the glass and stared as my hand shook violently, spilling the contents down my trouser front. ‘It will pass,’ he said, taking the glass away, ‘just a minor skirmish. It will be over soon. Things will calm down and everything will get back to normal. You will see. Nothing to worry about. Your first time in our beautiful country?’ I nodded and wiped the sweat from my face with a serviette. Things did get back to normal temporarily but the inevitable slide towards self-destruction accelerated, culminating in the Israeli invasion of 1982 and the bombing of a defenceless city. I arrived on the last plane from London just before the airport was shelled and destroyed. It was eerily silent and local militias were erecting barricades and setting up gun emplacements. A long line of abandoned cars stretched endlessly towards the skyscrapers in the city beyond and I could hear the shells exploding in the port of Damour not far to the South. My taxi driver smiled, asked me politely whether I would be staying long and apologised for not taking the scenic route along the coast. We detoured past the Palestinian refugee camps of Sabra and Chatila. Everybody seemed to be running. Women clutched babies to their chest; children dragged their few, remaining possessions down dark alleyways; and the gunmen manned the barricades, firing their AK 47s into the air and screaming Alluah Akhbar. God is great. Within a day, I was trapped. All the borders were closed and the Israeli navy appeared ominously on the horizon, blocking the last escape route to Cyprus. From my hotel balcony, I watched as the shells landed closer and closer and the F-16s circled like eagles above the city before dumping their payloads. The city erupted in fireballs. 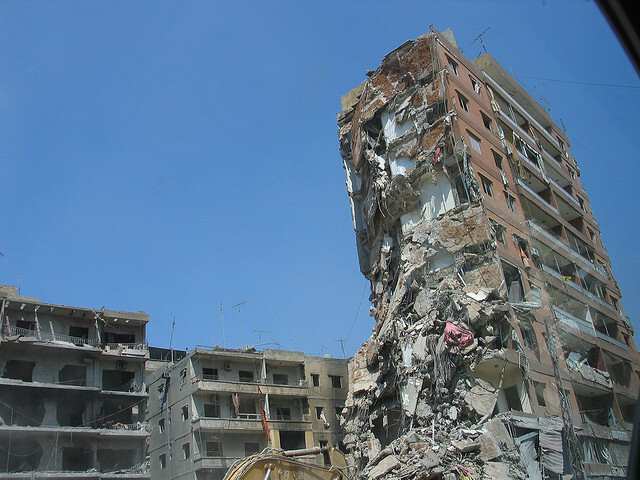 Whole buildings collapsed like packs of cards as the vacuum bombs impacted, sucking out the last dregs of air and leaving them a twisted mass of metal and rubble. Cars littered the streets, fused together in the intense heat like some grotesque pieces of sculpture. Streets became deserted and wild dogs roamed in packs searching for anything left to eat, even humans. I tried to carry on working but the office became more and more precarious as the Pink Panthers moved their heavy guns into the car park and fired round after round at the planes circling overhead. Most never reached their targets and exploded above us, showering the windows and balconies with shrapnel. Fewer and fewer workers made it to work and many fled for the relative safety of their summer homes in the mountains. Even the hotel turned its lights off at night and I would sit alone, drinking whisky, as the room erupted in a cacophony of noise and the shadows of tracer bullets danced along the walls. Eventually, I was given some money and told to leave. I was told that there were boats at Jounieh sailing to Cyprus and I should try and make my way there. I did find a yacht, the Sea Victory, packed with families and we negotiated our exit from the small, picturesque port, only to be surrounded by Israeli gunboats some miles offshore and turned back towards a Beirut that was erupting in flames. For three days we shuttled in and out of the port, each time confronted by gunboats locking their lights and canons on us and threatening to blow us out of the water. They would line us up along the railings, highlight specific individuals in their searchlights and then send over commandoes to take off any men they suspected of being Palestinians. We watched as the men were dragged away from their distraught families, handcuffed and thrown unceremoniously into the dinghies. I did eventually reach Larnaca and returned to Beirut some months later. The Israelis had withdrawn and Arafat and the PLO fighters had agreed to leave. There was calmness and an air of optimism in the city that was totally unexpected. I sat in a smart, seaside restaurant, L’Orangerie with some friends eating a sumptuous meal until one of my Lebanese colleagues was told that there was an urgent phone call for him. He returned, ashen-faced and told me that the bulldozers were filling mass graves with the bodies of thousands of Palestinian women and children slaughtered by the Christian Phalangists in the refugee camps of Sabra and Chatila, not more than half a mile from where we were eating. I flew home the next day. I never returned to the Lebanon for 23 years.